Each week I know two things. A) I need to make a trip to the food store either on Saturday or Sunday for our weekly meals. And B) I want to cook something that will make great leftovers and that can be freezable and then I think, I want to get creative and inspired and cook something different. Sometimes that happens and sometimes it doesn't. I just know something else: cooking at home is healthier, saves money, and we enjoy it. We also love eating together at the dinner table as a family. We began doing this since Claire was around 6 months old. Again, some days are different than others and that doesn't always occur, but we try. Most nights out of the week, whatever we eat, Claire has a little bit as well. So I know it's healthy and tasty. With a fruit and veggie on the side for good measure. As my husband has quite the picky palate, meaning that I rarely make meals that have asparagus in them, or butternut squash, carrots or mushrooms ( I love all of those veggies)! 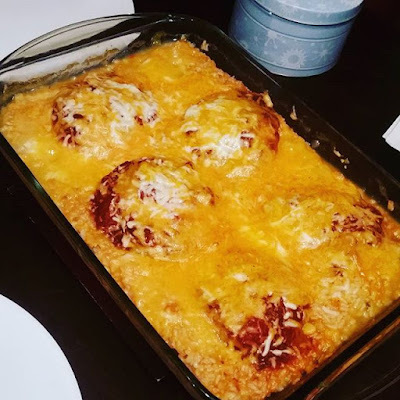 I do appreciate his simple and classic tastes like chicken parmesan, roasted or grilled chicken, potatoes, Spaghetti and meatballs, grilled steak (he's the griller of the family) and of course mac and cheese casseroles and ground turkey( or any kid of) taco night. I'm thankful that he at least loves all peppers, cucumbers and some spicy food along with most of my desserts! I did mention I prefer cooking to baking, right? 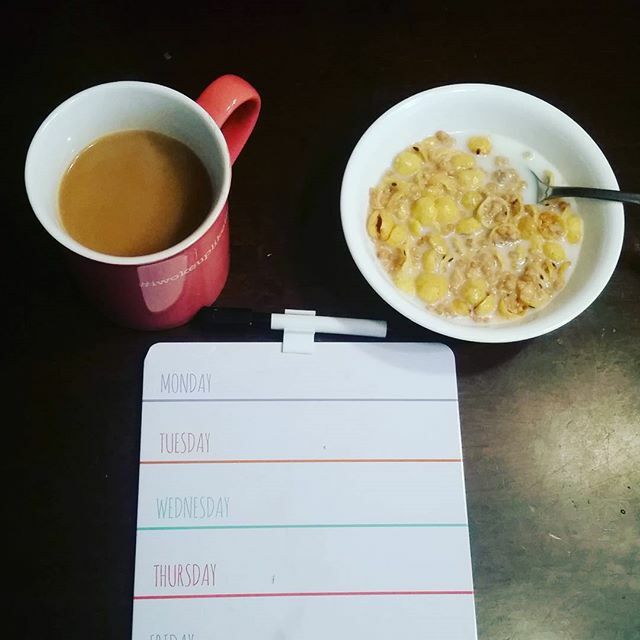 ( cute whiteboard/magnetic daily planner from target; $1 bin)! Tuesday: Monday night I prepared Crockpot Turkey Lasagna before bed. The hubs is working from home so he'll turn it on at Noon to cook on low for 6 hours. ( with left instructions of course). ha! This recipe is a bit healthier too with ground turkey, low-sugar pasta sauce and cottage cheese in place of ricotta. We've eaten this before and it is GOOD! it also makes a lot so plenty of leftovers and freezable! Wednesday: I'm taking my mom out for dinner for Mother's Day since I won't see her on actual Mother's Day. ! So the hubs can eat whatever he wants ( hopefully leftover lasagna though). Thursday: Leftovers or take out. We'll see what hubs ate on Wednesday and go from there. ha. Friday: Grilled salmon with a side salad. Sometimes after I write out the weekly menu, it doesn't always match up. We may have pizza on a night I was going to make a casserole. It depends on the day and how we feel but I think it's helpful to plan it out and have a guide to use. What do you think about leftovers? How often do you do take out and what do you choose?